Small on size, but big on performance, the Daiwa Fuego CT Casting Reel packs advanced technology and unbeatable quality into a budget-conscious, compact construction. 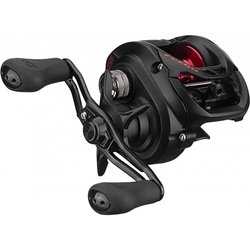 Built using the same, palm-sized aluminum frame as the Tatula CT, the Daiwa Fuego CT Casting Reel employs Magforce-Z, which combines the best attributes of old-fashioned mechanical braking with today’s magnetic braking technology, resulting in adjustable cast control and outstanding backlash management. Also equipped with Daiwa’s U.T.D. (Ultimate Tournament Drag) system, the Daiwa Fuego CT Casting Reel delivers super-smooth performance and increased cranking power. Complete with a contoured, swept handle for all-day comfort, the Daiwa Fuego CT Casting Reel combines cutting-edge technology and tournament-caliber quality into a smaller, more controllable package.